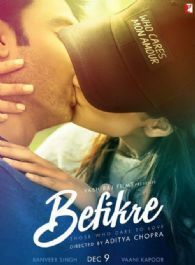 Befikre is a 2016 upcoming Indian Hindi-language romantic drama film written, directed, and produced by Aditya Chopra under his Yash Raj Films banner. It features Ranveer Singh and Vaani Kapoor in the lead roles. The film was shot over a period of 50 days in Paris and Mumbai. It is scheduled to release worldwide on 9 December 2016. Bollywood Greek God Hrithik, is geared up for another action sequence! This is what Vaani Kapoor has to say about Ranbir Kapoor!